I was out of the country for the past couple of weeks, where I had a bit of a summer produce breakdown. I wanted my corn and asparagus! I was craving peaches and plums and berries! I needed to try out my new ice cream maker! Summer was slipping me by! I calmed down a bit, ate mangoes in abundance (because that’s what you do where there are mangoes in abundance. and also what you do when you’re sad), and checked the weather online to make sure that summer aint goin anywhere. So here I am. Back in the country and jet lagged. And ready to make summery dishes using summery things! Starting with these little tarts. Barely sweetened, lightly spiced and completely highlighting the fruit, these are exactly what I was dreaming about. And what I will continue to dream about as I take another nap. 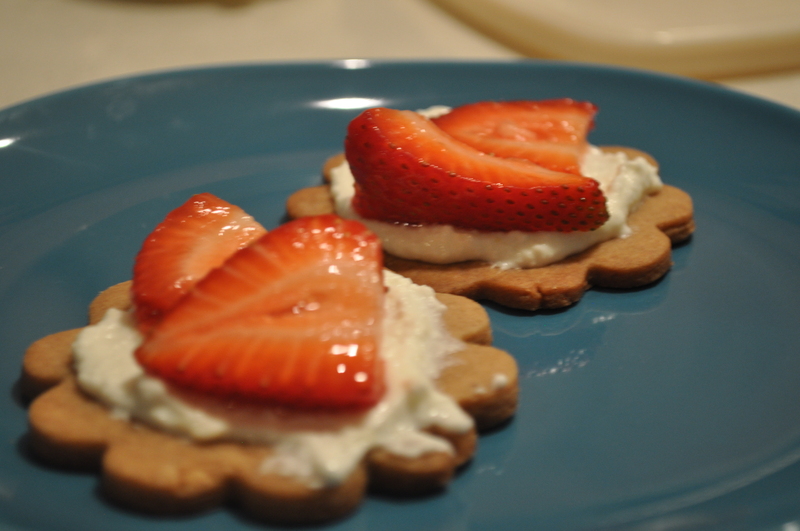 In the interest of full disclosure, you should know that I made these tarts a while ago. Meaning that I was fully alert at 2pm and had the energy to make everything from scratch. Which I’ve included below. But! I did have them again yesterday. Tired and delirious. With store-bought thin ginger cookies, and store-bought ricotta. And because I’m being so completely honest here, I’ll go ahead and say that these weren’t as good as the real thing. But what is, really? So you shouldn’t be surprised. And you’re not the one that’s jet lagged. So make these from scratch. There you go. In a bowl, whisk both flours with the cinnamon, salt and cloves. In a standing mixer fitted with the paddle, or with an electric hand mixer, beat the butter, light brown sugar and 2 tablespoons of the granulated sugar at medium speed until fluffy, about 1 minute. Beat in the honey and molasses, about 30 seconds. Scrape down the side of the bowl and beat in the flour mixture at low speed, just until incorporated. Pat the dough into a disk, cover with plastic and refrigerate until firm, about 1 hour. Preheat the oven to 350°. Line 2 large baking sheets with parchment paper. 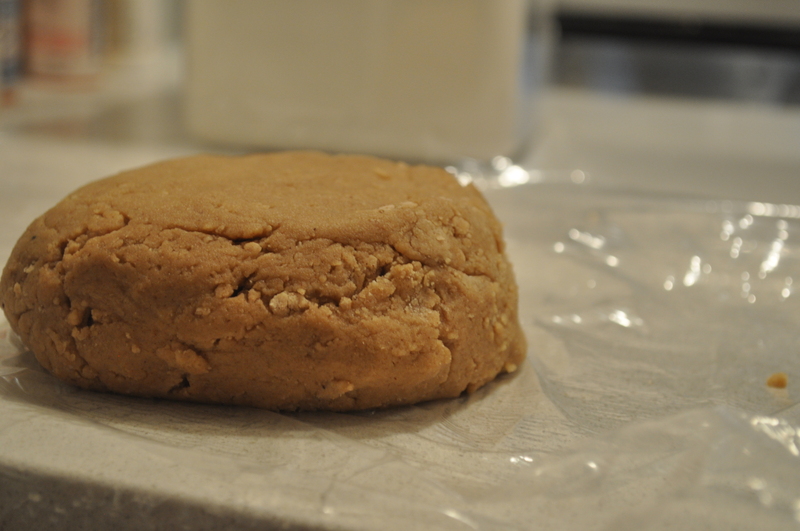 On a lightly floured work surface, roll out the dough 1/8 inch thick. Make sure that the dough is not too thick. 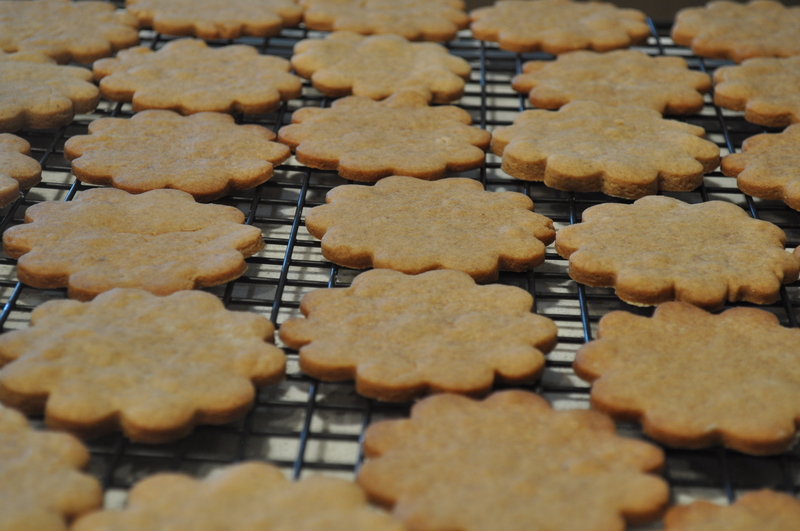 Using a 3 inch round cookie cutter, stamp out cookies; reroll the dough scraps if necessary. Transfer the shapes to the baking sheets and bake for about 12-14 minutes, rotating the pans halfway through, until lightly golden around the edges. Let cool on the pans for 5 minutes, then transfer the cookies to racks to cool completely. In a bowl, toss the strawberries with the remaining 1/3 cup of sugar and the lemon juice. Let stand until syrupy, 20 minutes. In a medium bowl, mix the ricotta, confectioners’ sugar and lemon zest. Spread about 1 tablespoon of the ricotta mixture on each oval. 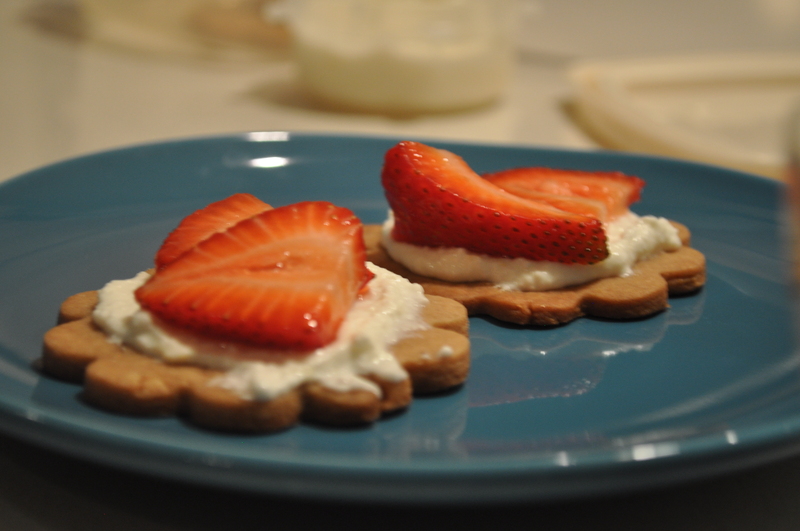 Arrange the strawberries over the ricotta, drizzle with the syrup and serve. For years, when I was younger, my birthday cake requests were on the, um, adventurous side. Which was slightly unfair because I was never expected to bake my own cake – I put the pressure on my family. I would want a strawberry chiffon cake in the winter. Or there was one year when I asked for a white cake with chopped up Oreos in it, with the request that the Oreos retain their crunch. My favorite was when I asked for an orange cake with lemon frosting. Apparently, I felt that it was a citrusy year. I have also adopted this experimental birthday cake baking when I make cakes for other people. You surely remember me getting all fancy with this coconut cake? Or what about this beauty with the macaron layer in the middle? Even these bars were for a birthday! 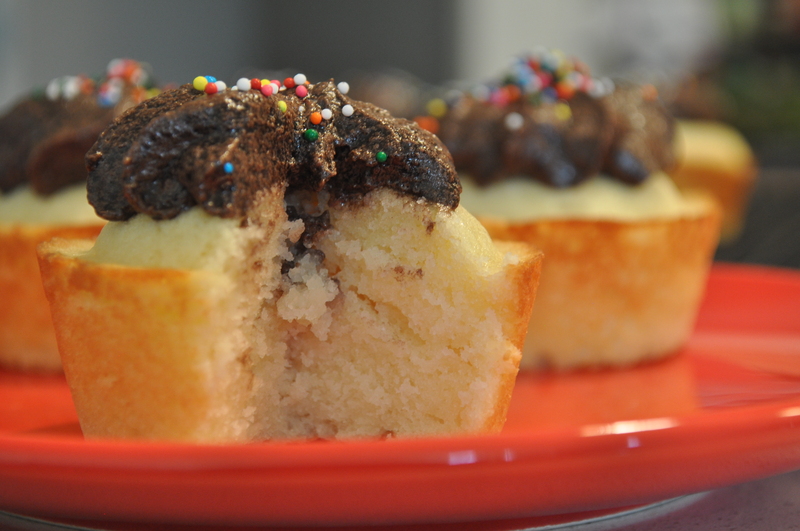 But all of this makes me miss my most favorite birthday cake combination: yellow cake with chocolate frosting. It’s a classic, after all, and oh-so delicious. And because of my high-maintenance birthday cake tendencies, I’ve never made this cake from scratch! The boxed cake mix and tub of frosting has always been enough for me. So I decided to give the at-home version a spin for a non-birthday occassion. With an unexpected malty twist in the frosting that will never have me reaching for the tubbed version again. These cupcakes have gotten me so hooked that I can’t think of a better cake to make for every birthday from now on – even my own. But someone else has to make it for me. Preheat oven to 350°F. 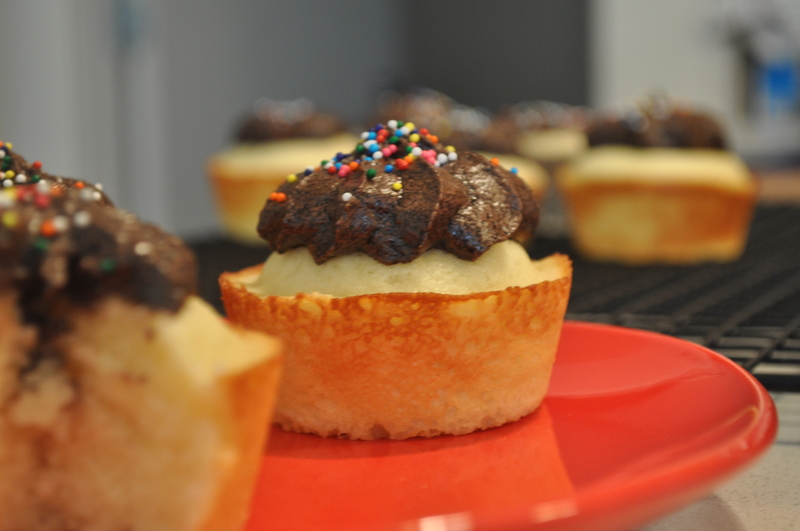 Prepare a 12-cup cupcake pan with paper liners. Sift together flour, baking powder, baking soda, and salt in a medium bowl. In a separate bowl, beat butter, sugar and vanilla in at medium speed until pale and fluffy. Add eggs 1 at a time, beating well and scraping down the bowl after each addition. At low speed, beat in buttermilk until just combined. The mixture may look curdled. Add the dry ingredients in three batches, mixing until just incorporated. 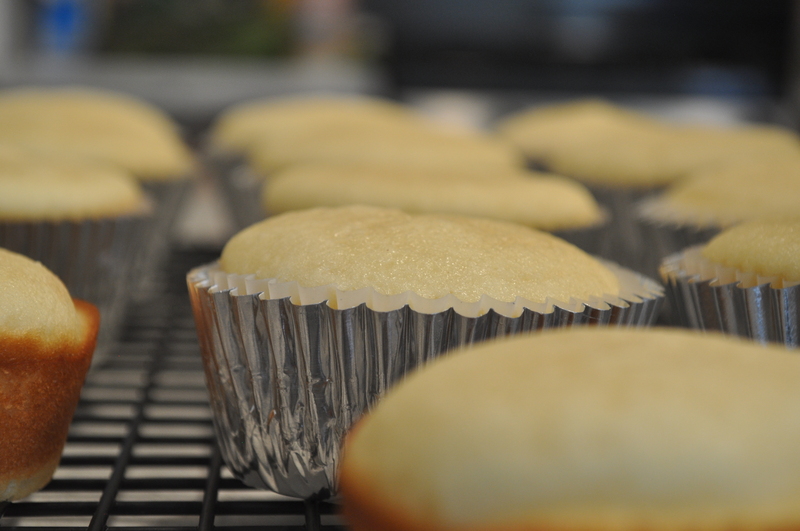 Divide batter evenly into the cupcake pan, then rap pan on counter several times to eliminate air bubbles. Bake until golden and a wooden pick inserted in center of a cake comes out clean, 18-20 minutes. Cool in pan on a rack 10 minutes, then turn over the pan to release cupcakes. Allow to cool completely on the rack. Frost with chocolate malt frosting. Cream together butter, cocoa powder and salt. Butter mixture will be very thick. Scrape down the sides of the bowl and add powdered sugar. Mix on low speed while adding milk and vanilla extract. As the sugar incorporates, raise the speed of the mixer to beat until smooth. In a glass, stir together heavy cream and Ovaltine. Turn mixer speed to medium and pour cream mixture into frosting in a slow, steady stream, until you’ve reached your desired consistency. You may not need the full amount of Ovaltine and cream. 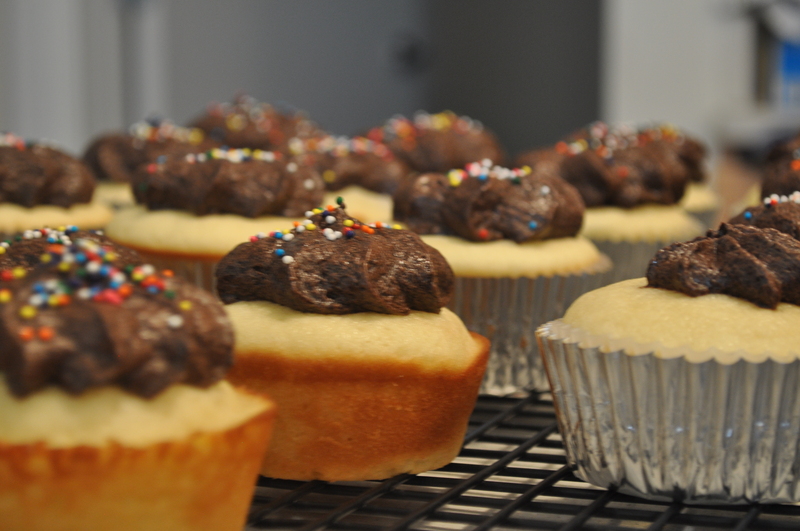 Spread onto cupcakes. I’m at that point in a move when you swear you have seen something that you are looking for but can’t seem to find it anywhere. You know that point when there are boxes everywhere and all counter space is taken and you don’t even know how some things you don’t need at all made it from one place to the other, and those things you really need are no where to be found. It’s quite lovely, moving. You may have done it. The one thing that I found quickly and easily were my baking sheets. And that was because I carried them by hand. Because they didn’t fit in a box. And because, you know, they’re special to me. I’m protective. This was perfect because two baking sheets were all I needed for this satisfying and comforting, yet unfussy meal. Especially because it is precisely when you are moving and you can’t find anything you need that you want something home cooked. Even when you have to eat it sitting on the floor, using boxes as tables. Not that I’m saying that I did that. To add some luxury to a time when you feel constantly dirty and sweaty, I bought this puff pasty. It’s made with 100% butter, which makes it 100% yum. Seriously. It was so good that I made some leftover puff pastry with just cheese on it. Butter and cheese. Don’t judge. Place a rack in the center of the oven and preheat oven to 400 degrees F. Line a baking sheet with parchment paper and set aside. Unfold thawed puff pastry onto a lightly floured work surface. Carefully cut the puff pastry into 6 or 8 even rectangles. The number of squares will depend on the brand of puff pastry you get. With a small knife, score a 1/4 inch boarder along the inside of each rectangle. 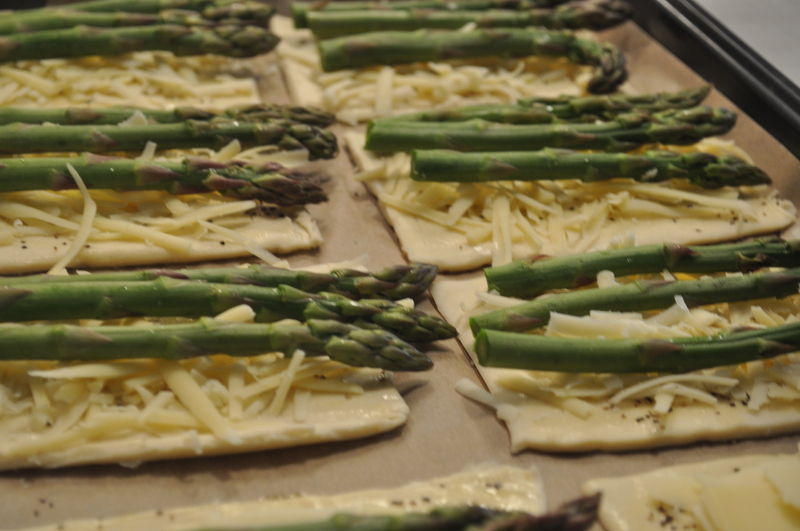 Arrange 1 inch apart on the prepared baking sheet. Brush each square lightly with beaten egg. Sprinkle with salt and black pepper. Top with a generous sprinkling of grated cheese. 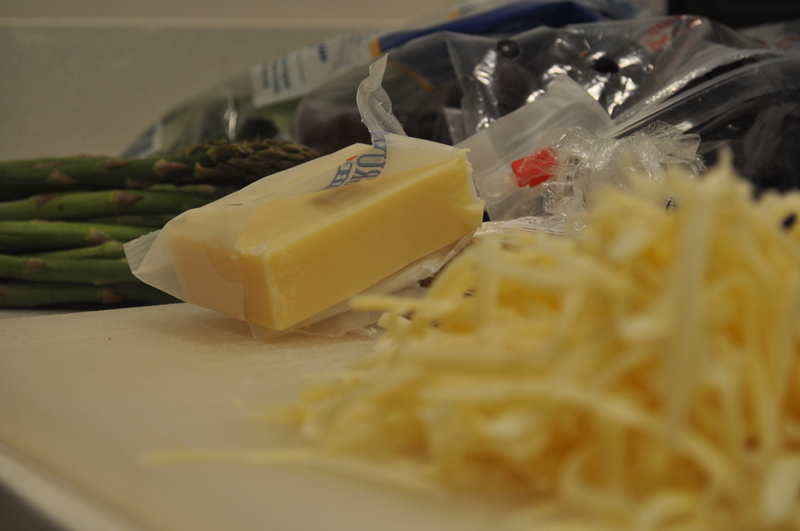 Press five to six asparagus spears into the cheese. 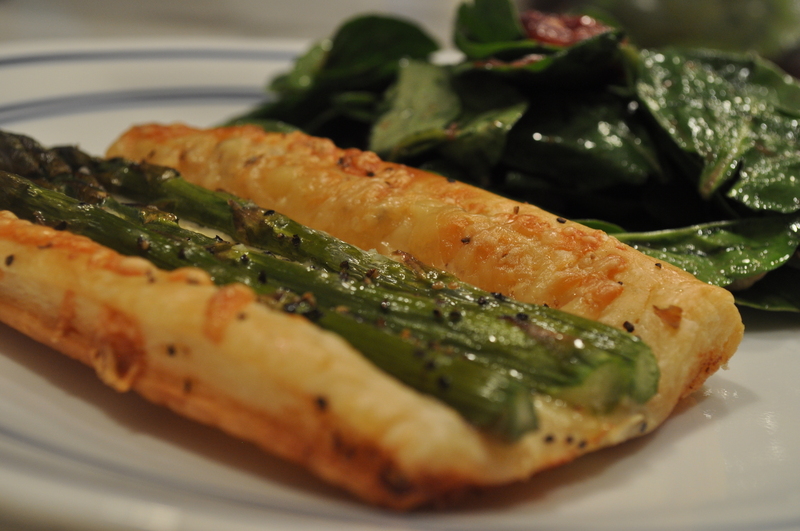 Brush the asparagus with olive oil and sprinkle with more salt and black pepper. 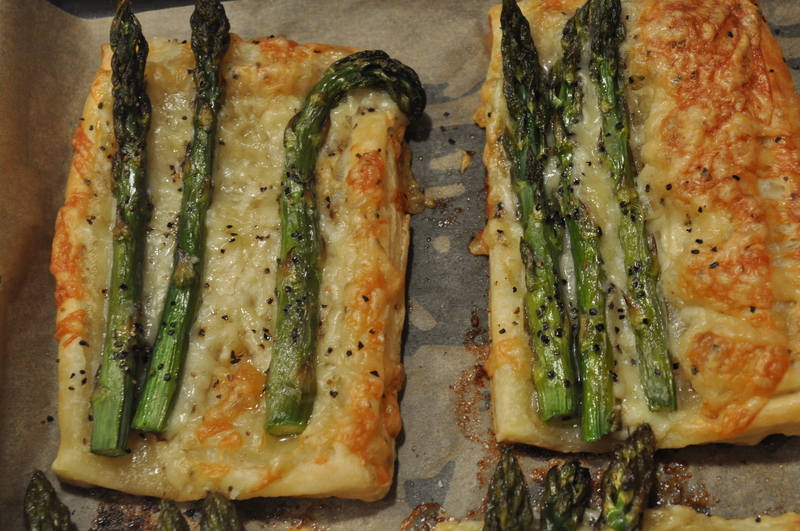 Bake for 20 to 25 minutes, until puff pastry is golden brown and asparagus is cooked through. Remove from the oven, allow to cool for 10 minutes before serving. Serve with thick balsamic reduction. I don’t have measurements for this recipe. I just roasted some grapes the way I would roast any vegetable, except that I added some balsamic vinegar. You just want to make sure that all of the grapes are evenly coated – not too much and not too little. The grapes will come out sweet and a little tart and the perfect balance to the salty, cheesy tarts. Line a baking sheet with parchment paper. Take the grapes off the stems and wash them. Lay them out on the baking sheet. Coat with olive oil and balsamic vinegar. Sprinkle with salt and pepper until everything is evenly coated. Place in the oven at the same time the tarts go in. They will take the same amount of time: about 20-25 minutes. While the grapes are in the oven, take the stems off the spinach leaves, wash and pat dry. Place in a large bowl. When grapes come out, let them cool on the baking sheet for about 5 minutes and then toss with spinach leaves. The coating on the grapes will create a dressing for the salad.